With the upcoming release of Patchwork 2.0, Patchwork will provides first class support for series, or collections of patches, and expose these (and much more besides) over a new REST API. 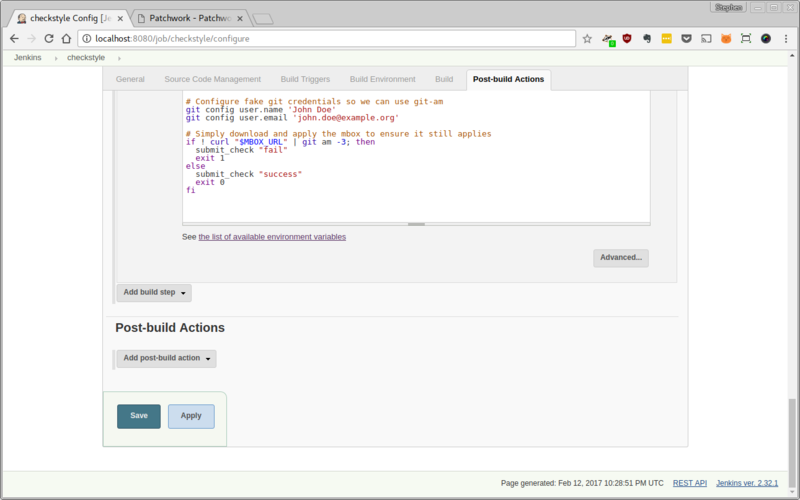 Coupled with the Check support added in 1.1, we will be able to use Patchwork with continuous integration and automated testing tools like Jenkins to validate projects using the mailing list workflow. Below is the result of my own experiments coupling Patchwork with Jenkins. Be aware that this represents but the very basics of what one can do with this functionality. However, I aim to build upon this later and this should still serve to illustrate most of the key concepts. An even simpler guide will be available in the Patchwork documentation shortly. NOTE: This guide has been updated since publication to reflect the changes found in Patchwork 2.0. Before we begin, we need to install both Patchwork and Jenkins. 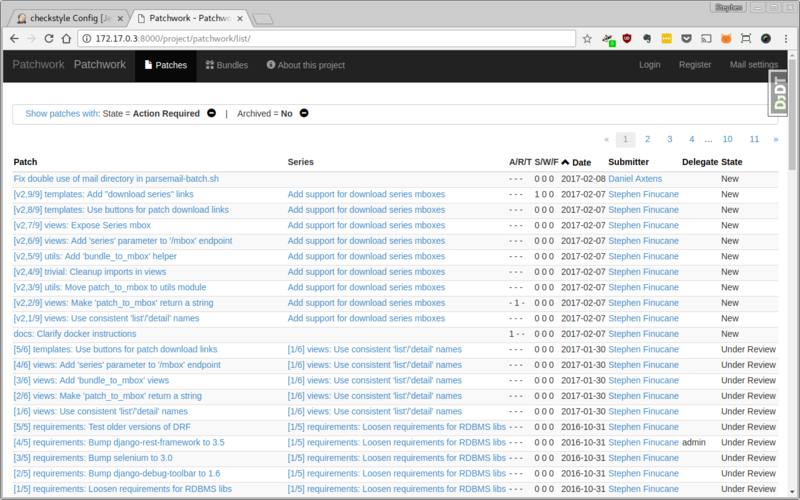 I chose to use Docker for this, though Patchwork can also be installed manually. Leave this running and jump to another tab. Once initialized, you should be able to browse Patchwork at localhost:8000. A default Patchwork project will have been created, which we will use for this demo. Note that you can install additional plugins if necessary but these are the bare minimum. Once this step is completed, both services should be accessible: the Patchwork instance at localhost:8000 and the Jenkins instance at localhost:8080. Both instances should have a user account configured, using the admin username and tester password. Finally, the Patchwork instance should have the default Patchwork project. Record all of these details for future steps. Once the services are initialized, we need to configure them. where <CONTAINER_NAME_OR_ID> refers to the active patchwork_web container. This will return an IP address, in my case 172.17.0.3. Ensure you can access the Patchwork instance via this address (including port) - for example at 172.17.0.3:8000 - then store this IP for later. Once you have this token stored, we can move onto configuring the Jenkins job. 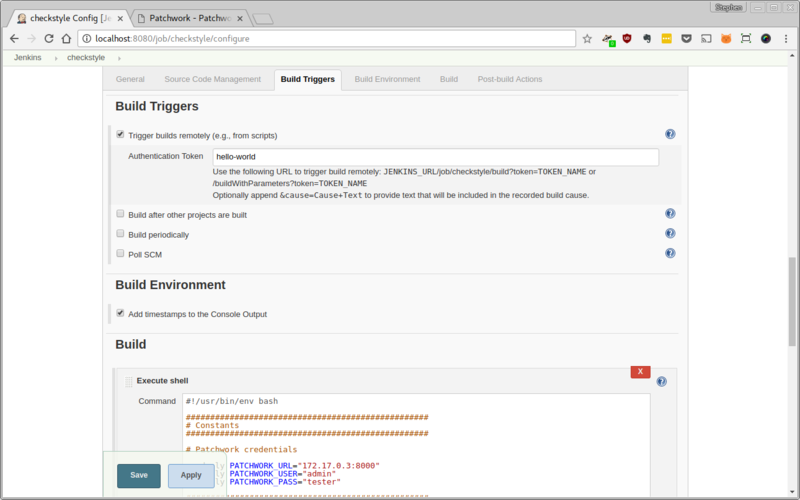 We’re going to make heavy use of Parameterized Builds and the Remote Access API, both of which are part of the default Jenkins install. The URL to download the patch from. The URL to report the test result to. While we could expand the available parameters to avoid hard-coding variables and make the job more flexible, we’re going to keep it simple for now. You don’t need to specify credentials, nor should you change the default branch specifier. You should, however, enable the Clean before checkout behavior, to ensure old tests don’t corrupt newer tests. For the Build Triggers section, we’re going to trigger this remotely using another script. Simply tick the relevant box and set an “authentication token”. Use hello-world as a token. The Build Environment section can be mostly ignored. Simply enable timestamps in the build output. You’ll notice we’re really not taking advantage of Jenkins’ power here but bear with me: these are baby steps. Finally, the Post-build Actions. I didn’t make use of this section, though I’m sure the above script could be broken up to make use of this. Some other time, perhaps. Once this step is complete, you should have configured a basic Jenkins job that can be kicked off using the API. This job uses the credentials and IP of the Patchwork instance. You’ll also have a token for your Jenkins user, which we will use to talk to the Jenkins API. 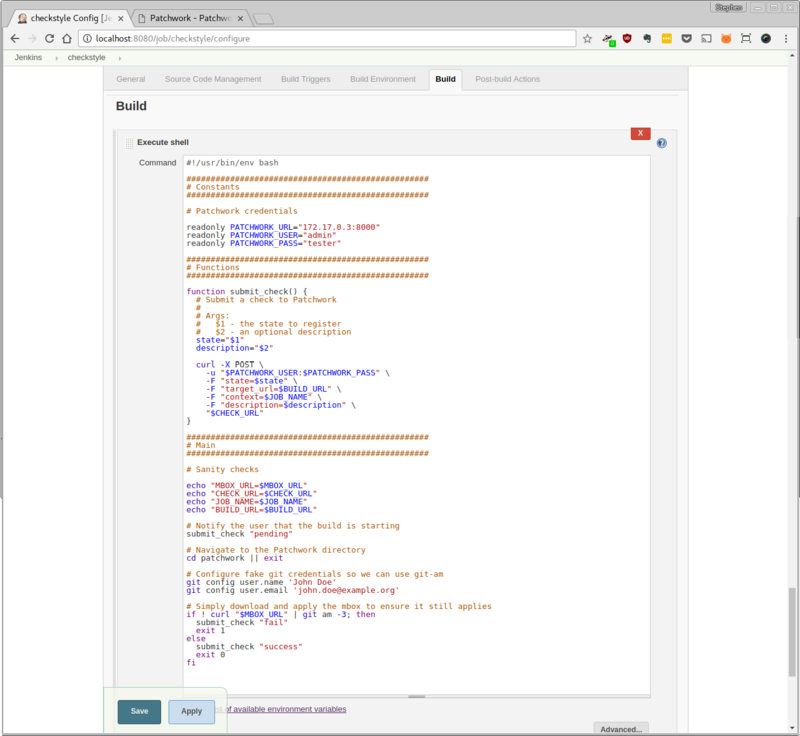 We’re going to use a rather simple Bash script to kick of the Jenkins build. We could do the exact same thing in Python (it would likely be more robust), but Bash makes for a good first pass. The script consists of a number of different parts: all should be combined to produce the final scripts. 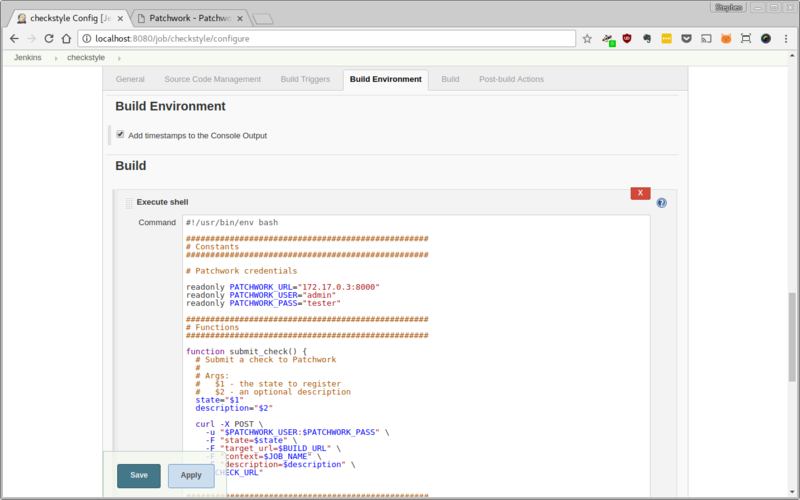 First up in the script: Jenkins and Patchwork credentials. We’re going to hard-code these for now, using the Jenkins username and token and Patchwork username and password we configured/collected earlier. We’re also going to create some function stubs, which we will populate later. Note that Jenkins requires that you supply a “crumb” with all requests to prevent CSRF, so we gather that now. More information is provided in this StackOverflow question and in the remote access API wiki. Next, the polling of /events. This is an endpoint in the Patchwork REST API that reports events related to elements like patches, series or checks. A list of all supported events is provided in the docs but there are two that we care about here: patch-created and patch-complete. Per the docs, the first of these occurs when a patch is added to Patchwork. The second, meanwhile, occurs when all dependencies (if any) are met. This means that if a two patch series is sent to Patchwork and the second patch is received first, only the patch-created event will be created for this patch. Only when the first patch in that series (the second patch’s only dependency) is received will the patch-completed be raised for the second patch (the patch-created and patch-completed events will be raised at the same time for the first patch, given that it has no dependencies per se). The below section of the script deals with reading these events from the Patchwork API. Note: The use of the Host: header is important - without this, responses will be returned using localhost as the host name. This won’t be usable from another container. The response from the /events API will include links to the created patch and, for the patch-completed event, the patch series which is providing the dependencies. We must retrieve the patch and series from the Patchwork API. Note that, in a future version of the API, we should support an embed parameter that would allow us to embed the patch and series in the response and avoid these additional requests. 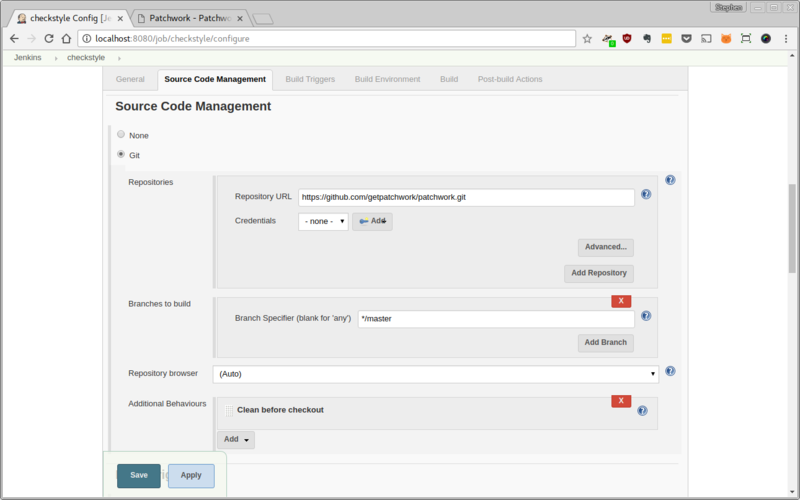 Once we have the patch_url and series_id, we can submit the job to Jenkins. We’re going to do this via a call to the submit_job function, which we already defined a stub for. Implementing this function is rather simple, given that we have already configured the job and gathered all required parameters and credentials. Replace the above stub with the below function. mbox_url="$(echo $patch | jq -rc '.mbox')?series=$series_id"
check_url="$(echo $patch | jq -rc '.checks')"
echo "Job parameters: PATCH_MBOX_URL=$mbox_url, CHECK_URL=$check_url"
The Jenkins API requires parameters be passed via a JSON body rather than than individual fields. This differs from Patchwork. The Jenkins API requires the inclusion of a crumb header, by way of the JENKINS_CRUMB that we stored earlier. This is intended to prevent CSRF attacks. More information on the Jenkins API can be found in remote access API wiki. Note that this must be downloaded to the patchwork directory, else it will not be accessible from the Docker containers. Keep an eye on the /events URL - you should notice a few new patch events. Run the script on your host and watch the end result. That script will read the events stream, filter the events we care about, and kick of Jenkins builds for the patches you just added. Jenkins will then take over, reporting that it is starting testing to Patchwork, actually running the tests, then reporting the end result to Patchwork. 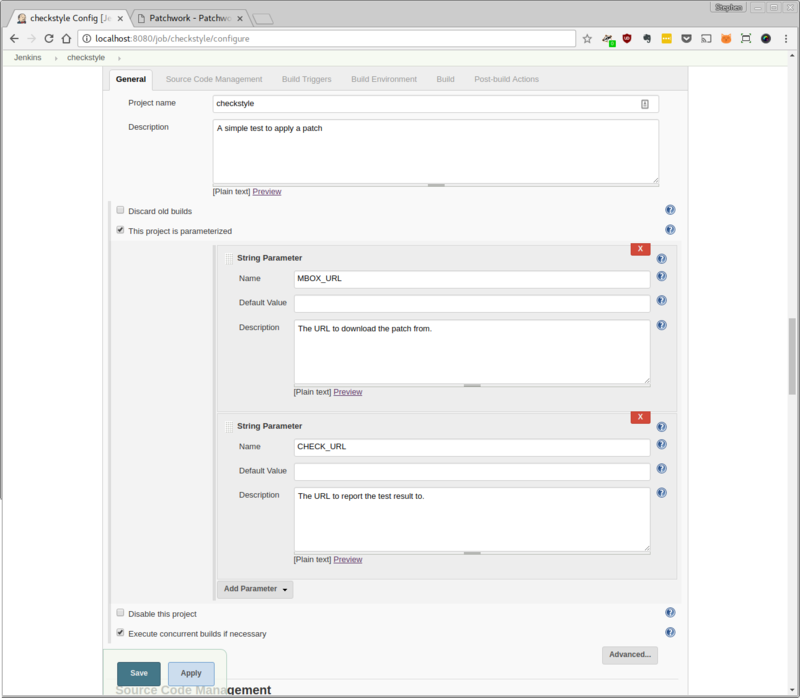 You should be able to see the jobs running in Jenkins, and the resulting checks reported in the API. Not all of these features are required for building an automated testing system. For example, if you didn’t want to test series or were happy testing individual patches, you could skip the series support. Likewise, you don’t have to report test results to Patchwork and could poll the /patches or /series endpoints instead of the /events endpoint to find patches to test. In my opinion though, this represents a great starting point for building an sustainable, stable, and ultimately beneficial testing infrastructure for projects using a mailing list workflow.